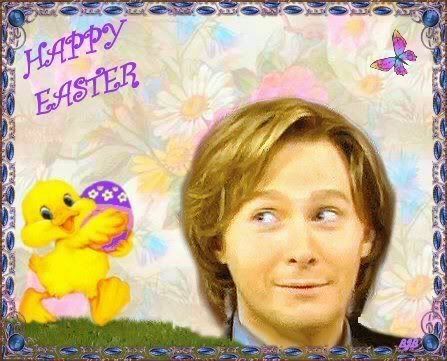 Clay Aiken – Easter Greetings To All! The following are some fun facts about Easter! Americans eat more candy at Easter than at any other holiday besides Halloween. An average of seven billion pounds of candy is consumed over Easter weekend. Sales of Easter candy top nearly $2 billion; in contrast, just over $1 billion of candy is sold for Valentine’s Day. The most popular Easter confection is Marshmallow Peeps. More than 700 million of these chick, bunny and egg-shaped marshmallows are purchased every year. A meager 90 million chocolate bunnies are consumed. At peak production, over four million Marshmallow Peeps can be made each day. Eating Easter candy is a relatively modern tradition. The first chocolate eggs, for example, were made in Europe in the 1800s. And Marshmallow Peeps, produced by the Russian-born U.S. confectioner Sam Born, didn’t get their start until the 1950s in the United States. The most popular treat to hide inside an Easter egg is jellybeans. Americans consume more than 16 billion of them at Easter — enough to circle the circumference of the globe three times! Over one billion Easter eggs are hunted every year in America. The most popular (or at least the most televised) Easter egg hunt is the one held at the White House. President Hayes hosted the first White House egg hunt in 1878, launching a tradition that has continued to this day. HAPPY EASTER SUNDAY EVERYBODY!! Why oh why do I have to work, lol! Happy Easter everyone. Have a safe blessed day. Happy Easter everyone!!! Musicfan, just wanted to wish you and your family a lovely day, and to thank you for all you do. It is greatly appreciated. gaymarie…take it easy, and don't work too hard. I worked Good Friday, but today I am just staying home cooking, and being with family. Oh…I forgot….HAPPY EASTER TO CLAY and all his family!!!!! He's the reason we are all here!!!!!! HAPPY EASTER to all. Hope that everyone has a wonderful and joyful day. My favorite Easter candy when I was younger – a solid milk chocolate six inch Easter bunny. These days it is Chukar's dark chocolate covered Bing cherries – no sugar added. Very delicious all year round. Happy Easter to the CANN "family". Everyday is special when we have Clay in our lives. While singing hymns in church today, I wondered if Clay was singing in his church. Just waiting for my family to arrive to eat, talk, and devour plenty of candy. I hope Clay and everyone at CANN are having a wonderful Easter. Error: Error validating access token: Session has expired on Tuesday, 21-Aug-18 16:13:01 PDT. The current time is Saturday, 20-Apr-19 02:46:49 PDT.